Don’t routinely recommend daily home glucose monitoring for patients who have Type 2 diabetes mellitus and are not using insulin. Self-monitoring of blood glucose (SMBG) is an integral part of patient self-management in maintaining safe and target-driven glucose control in type 1 diabetes mellitus. However, daily finger glucose testing has no benefit in patients with type 2 diabetes mellitus who are not on insulin or medications associated with hypoglycemia, and small, but significant, patient harms are associated with daily glucose testing. SMBG should be reserved for patients during the titration of their medication doses or during periods of changes in patients’ diet and exercise routines. 1–5: The American Academy of Family Physicians (AAFP) list is an endorsement of the five recommendations for Family Medicine previously proposed by the National Physicians Alliance (NPA) and published in the Archives of Internal Medicine, as part of its Less is More™ series. The goal was to identify items common in primary care practice, strongly supported by the evidence and literature, that would lead to significant health benefits, reduce risks and harm, and reduce costs. A working group was assembled for each of the three primary care specialties; family medicine, pediatrics and internal medicine. The original list was developed using a modification of the nominal group process, with online voting. The literature was then searched to provide supporting evidence or refute the activities. The list was modified and a second round of field testing was conducted. The field testing with family physicians showed support for the final recommendations, the potential positive impact on quality and cost, and the ease with which the recommendations could be implemented. More detail on the study and methodology can be found in the Archives of Internal Medicine article: The “Top 5” Lists in Primary Care. 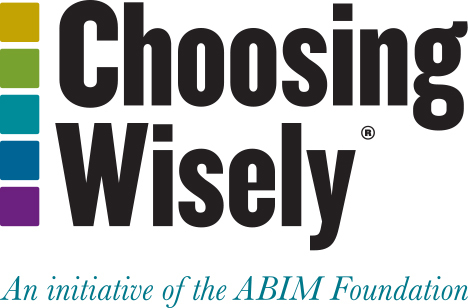 6–10: The American Academy of Family Physicians (AAFP) has identified this list of clinical recommendations for the second phase of theChoosing Wisely campaign. The goal was to identify items common in the practice of family medicine supported by a review of the evidence that would lead to significant health benefits, reduce risks, harms and costs. For each item, evidence was reviewed from appropriate sources such as evidence reviews from the Cochrane Collaboration, and the Agency for Healthcare Research and Quality. The AAFP’s Commission on Health of the Public and Science and Chair of the Board of Directors reviewed and approved the recommendations. In the case of the first two items on our list – “Don’t schedule elective, non-medically indicated inductions of labor or Cesarean deliveries before 39 weeks, 0 days gestational age” and “Don’t schedule elective, non-medically indicated inductions of labor between 39 weeks, 0 days and 41 weeks, 0 days unless the cervix is deemed favorable” – we collaborated with the American College of Obstetricians and Gynecologists in developing the final language. 11–15: The American Academy of Family Physicians (AAFP) has identified this list of clinical recommendations for the third phase of the Choosing Wisely® campaign. The goal was to identify items common in the practice of family medicine supported by a review of the evidence that would lead to significant health benefits, reduce risks, harms and costs. For each item, evidence was reviewed from appropriate sources such as the Cochrane Collaboration, the Agency for Healthcare Research and Quality and other sources. The AAFP’s Commission on Health of the Public and Science and Board of Directors reviewed and approved the recommendations. 16-20: The American Academy of Family Physicians (AAFP) has identified this list of clinical recommendations for the fourth phase of the Choosing Wisely campaign. Three recommendations were derived from AAFP Preventive Services Recommendations and two were based on other medical societies’ Choosing Wisely recommendations. The goal was to identify items common in the practice of family medicine supported by a review of the evidence that would lead to significant health benefits, reduce risks, harms and costs. For each item, evidence was reviewed from appropriate sources such as the Cochrane Collaboration, the Agency for Healthcare Research and Quality and other sources. The AAFP’s Commission on Health of the Public and Science and Board of Directors reviewed and approved the recommendations. AAFP’s disclosure and conflict of interest policy can be found at www.aafp.org. American Diabetes Association. Standards of medical care in diabetes. Diabetes Care. 2013;36 Suppl1:S11-66. Karter AJ, Parker MM, Moffet HH, Spence MM, Chan J, Ettner SL, Selby JV. Longitudinal study of new and prevalent use of self-monitoring of blood glucose. Diabetes Care. 2006;29:1757-63. Harris MI. Frequency of blood glucose monitoring in relation to glycemic control in patients with type 2 diabetes. Diabetes Care. 2001;24:979-82. Malanda UL, Welschen LMC, Riphagen II, Dekker JM, Nijpels G, Bot SDM. Self-monitoring of blood glucose in patients with type 2 diabetes mellitus who are not using insulin. Cochrane Database of Systematic Reviews 2012;1:1-88. O’Kane MJ, Bunting B, Copeland M, Coates VE; ESMON study group. Efficacy of self-monitoring of blood glucose in patients with newly diagnosed type 2 diabetes (ESMON study): randomized controlled trial. BMJ. 2008;336:1174-7. Peel E, Douglas M, Lawton J. Self-monitoring of blood glucose in type2 diabetes: longitudinal qualitative study of patients’ perspectives. BMJ. 2007;335:493-8. Cameron C, Coyle D, Ur E, Klarenback S. Cost-effectiveness of self-monitoring of blood glucose in patients with type 2 diabetes mellitus managed without insulin. CMAJ. 2010;182(1):28-34. Canadian Diabetes Association Clinical Practice Guidelines Expert Committee, et al. Monitoring glycemic control. Can J Diabetes. 2013 Apr;37 Suppl 1:S35-9. Davidson MB, et al. The effect of self monitoring of blood glucose concentrations on glycated hemoglobin levels in diabetic patients not taking insulin: a blinded, randomized trial. Am J Med. 2005 Apr;118(4):422-5. PMID: 15808142. Farmer A, et al. Impact of self monitoring of blood glucose in the management of patients with non-insulin treated diabetes: open parallel group randomised trial. BMJ. 2007 Jul 21;335(7611):132. PMID: 17591623. O’Kane MJ, et al. Efficacy of self monitoring of blood glucose in patients with newly diagnosed type 2 diabetes (ESMON study): randomised controlled trial. BMJ. 2008 May 24;336(7654):1174-7. PMID: 18420662.